...starting at Union Square North (and several other locations, apparently). Come along for the ride! The bike ride that helped change the whole city. In New York City during the 1990's, bicycling was extremely dangerous. The number one complaint of cyclists was always safety. Group bicycle rides, like the critical mass, were one of the few places where cyclists could ride together and be safe. Besides their safe and fun dynamic, the group rides steadily attracted new riders which in turn built up the confidence in the riders to become everyday commuters. In early 2000, the New York City critical mass started gaining huge popularity due to it's celebratory spirit and safe community environment. Bikers of all types would meet the last Friday of every month, as they do in over two hundred cities around the globe, for the monthly critical mass rides. The critical mass ride in New York City has always been a place where new riders could feel safe while building a strong community voice for non polluting transportation. The cyclists were also fed up with the lack of safe bike infrastructure, and were continuously putting pressure on the City for more bike lanes, bridge access and green infrastructure that most cities around the world already were enjoying. Some short sighted few in the New York City Police Department attacked the critical mass riders with a vengeance. They tried everything from law suits, tickets, arrests, and harassment, to violence, spying, undercover agitation, divisionary propaganda, and even going to the point of cutting locks and stealing peoples bikes to try and stop the bike movement. However, the bikers were persistent and adopted slogans like 'Still We Ride!' despite the harassment. Eventually, after much persistence and global media embarrassment, the bicycle community got their way and New York City hired a new and bike friendly D.O.T commissioner who had vision. Today, our new greener, safer and bike friendly city is now enjoyed by all. In fact, the very spot in Times Square where each month thousands of cyclists raised their bikes over their heads is now an auto free zone. Thank you New York City critical mass for this positive sustainable change! TIME'S UP! is now sponsoring screenings of Still We Ride! (the documentary film about Manhattan Critical Mass). 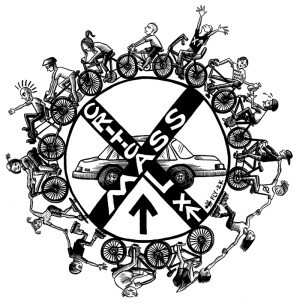 April 2013 was the 20th birthday of Critical Mass in NYC. Happy birthday! "Thanks for letting me know about the best ride of my life, New York City's Critical Mass (Ride, Nov.). We rolled into Times Square a couple thousand strong and 10 blocks long, including riders from Boston, California and Japan. I've lived here my whole life and have never seen the city like this." Critical Mass is not like a TIME'S UP! ride with leaders and routes. It is traffic using the streets. TIME'S UP! works on themes and after-parties to make Critical Mass more fun.